Two weeks tomorrow I will be headed off for another adventure. At the ripe old age of 38 I will be camping for the first time. Shock horror!! For most TV presenters that would pose a challenge in itself. Do they make solar-powered hairdryers? But you see despite my so-called “glamazonian-image” I do actually enjoy being outdoors especially when wildlife is involved. My trip is not primate related, neither does it take me back to Africa, but as an adrenaline junkie it is certainly high risk, it is hugely challenging physically and involves the North American wilderness. I’m headed to grizzly bear country!! Although I am super excited I must confess I am a tad nervous. 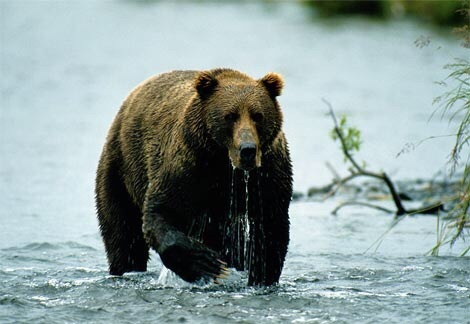 For as long as I can remember I have been obsessed by bears (sharks and big cats any predators basically). I love watching reconstructions of ‘bear encounters’ on low-budget programmes; cheesy d-rated movies about crazed bears picking off a group of hapless hikers as well as educated and well put together programmes following biologists studying bears. If there had been a Masters degree specifically on bears, the primates would not have had a look-in. 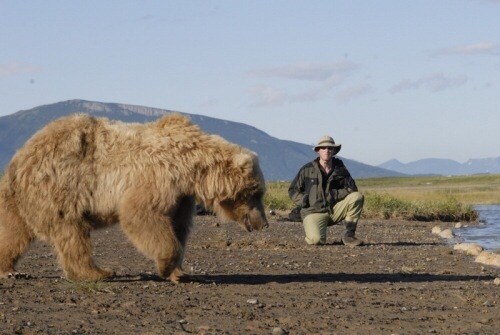 When the Werner Herzog film — Grizzly Man — about Timothy Treadwell came out in 2005 I went to watch it twice at the cinema and then bought the DVD. Herzog documented the antics of Treadwell and his time with the grizzlies at close range in a remote part of Alaska. It used Treadwell’s own pieces to camera with bears; his footage and then Herzog also carried out interviews with Treadwell’s loved-ones about his passion for bears. Treadwell spent 13 summers in Alaska. Personally I think he was “bonkers” to believe that he could habituate predators like the grizzly. Out of all the bears they have the most fearsome characteristics. In 2003 he and his girlfriend were killed and eaten by a rouge male bear. It was just hours before they were due to be picked up by plane and taken home. The incident was recorded on camera. I have no intention of getting close to bears and I will be staying at least 200m away. There will be no pieces to camera with a bear that weighs almost the same as a silverback gorilla (225kg) in the background. Selfies will be out of the question. And car camping may be the safest option if I want to be able to use both my arms and legs when I return. I am not off to Alasaka however, but back to Wyoming. My first introduction to this beautiful landscape was last September. I visited Jackson Hole for a Great Apes Summit hosted by the UN’s Great Apes Survival Project which tied in with the annual wildlife film festival. This time however I will be headed to a remote part of the Washaki Wilderness and also to Montana. Franc’s Peak which is in Wyoming is around 4,000m. It is meant to be breath-taking and rich in all types of biodiversity. Bear populations have increased over the years and sightings says my mate who is coming with me and lives in Montana, “knocks the ball out of the park”. We are hoping to see them during their moth-eating season. It is a precious window when they wander around flipping over rocks and licking up the moths (to stock up on fat and protein) ahead of hibernation. I take some comfort in that fact that I will probably look like a toothpick compared to my friend, B, if the bears were weighing up their menu options. But let’s not dwell on that image. To the South West of this area is Yellowstone and to the South East are the Tetons. 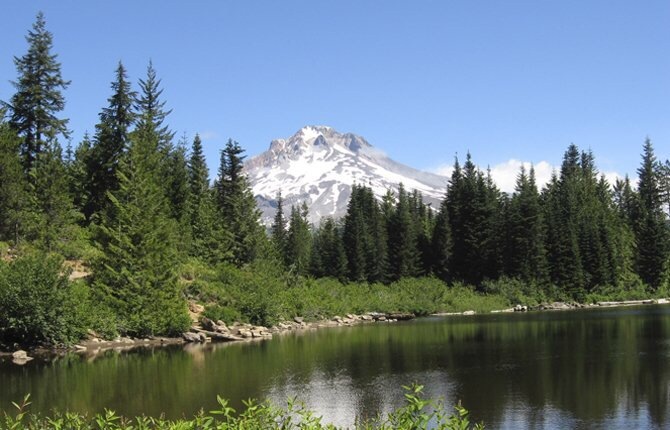 Primitive camping is to be expected, ie: no official site. We will probably end up sleeping in the pick-up truck and there is also no mobile phone signal. Providing I survive the first week we are then headed up to Glacier National Park for proper camping, more hiking, kayaking down “mellow rivers” (drowning is also pretty low down on my list of things to have happen) and overnighting for one or two days in log cabins. When your best option for survival in a worst case scenario is to drop to the floor and play dead, for the next two weeks I will be swotting up on the ‘bear necessities’ to avoid that situation like the plague! !